Fibroadenoma (FA) of the breast is a common benign tumor, previously accounting for approximately 50% of breast biopsies in the United States. It is the second most common breast pathology following fibrocystic changes. Histologically, FA consists of abundant hypocellular stroma surrounding sparse epithelial/myoepithelial lined spaces. Current practice guidelines advise that a small FA which is neither increasing in size nor symptomatic may be managed with careful observation and follow up. The overall risk of developing malignancy from a FA is low, varying from 1.5 to 2.6-fold compared to controls in several studies. The incidence of carcinoma within a fibroadenoma is reported to be between .1% and .3% in a screened population. In the present report, we discuss two patients, each with a history of FA, who were found to have Stage III breast cancer arising from a pre-existing FA. A 59-year-old white woman with a 17-year history of FA was referred to our breast clinic after an annual mammogram revealed a left 1.8 x 1.6 cm lobular mass at 12:00, which had been stable for the last 3 years, and new prominent left axillary lymph nodes. She had no prior history of cancer and no family history of breast or ovarian cancer. She was GºPº and post-menopausal. Her physical exam was positive for an enlarged left axillary lymph node, but no dominant palpable breast masses. Ultrasound guided biopsy of the lymph node identified invasive lobular carcinoma (ER⁺/PgR⁺/HER2⁻) and a biopsy of the 12:00 mass confirmed a benign FA. A breast MRI confirmed the findings but was not able to detect a primary breast cancer. She underwent left partial mastectomy (excision of the FA) with Level I and II axillary dissection. The final pathology report confirmed moderately-differentiated, grade II invasive lobular carcinoma, measuring 1mm in greatest dimension, identified in a background of FA. (Fig. 1A, B). Left axillary lymph node dissection revealed metastatic lobular carcinoma in 11 out of 13 nodes with the largest focus measuring 1.2cm. She is currently being treated with adjuvant chemotherapy, four cycles of dose-dense Adriamycin/Cyclophosphamide, followed by 12 cycles of weekly paclitaxel, adjuvant radiation and 5 years of Arimidex. Figure 1: Patient 1, Lobular Carcinoma arising in Fibroadenoma. 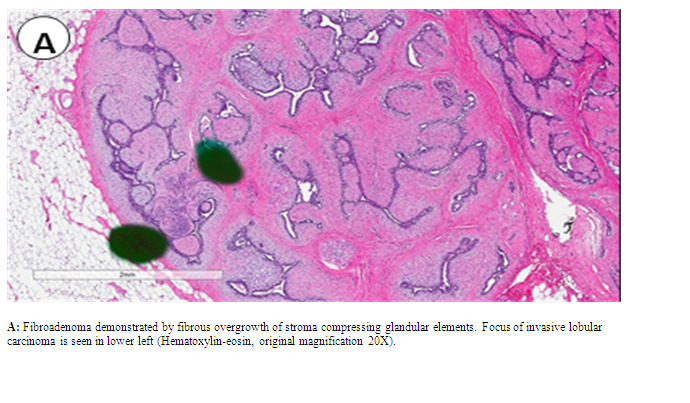 A: Fibroadenoma demonstrated by fibrous overgrowth of stroma compressing glandular elements. Focus of invasive lobular carcinoma is seen in lower left (Hematoxylin-eosin, original magnification 20X). B: Malignant cells are shown with distinct cellular borders and small, round nuclei. They are invading the stromal tissue in a single-file fashion (original magnification 100x). A 60-year-old G3P3, postmenopausal, female presented to our clinic with a 12-year history of benign palpable breast masses. Within the past year, a mass in the left breast at 12 o'clock had increased in size and was associated with skin dimpling. She had a paternal aunt who had a history of postmenopausal breast cancer, currently alive and well after treatment. Mammography and ultrasound from an outside institution revealed a left breast mass measuring 1.4 cm at 12:00. On physical exam, the mass measured 5 x 5.5 cm with overlying skin dimpling at 12:00, but she had no palpable axillary, supraclavicular or cervical lymphadenopathy. She underwent total mastectomy with excision of 6 sentinel lymph nodes. Final pathology report revealed a 3-cm moderately differentiated, grade II invasive ductal carcinoma (ER+/PgR+/HER2-) in the left breast arising in a FA (Figure. 2A, B). 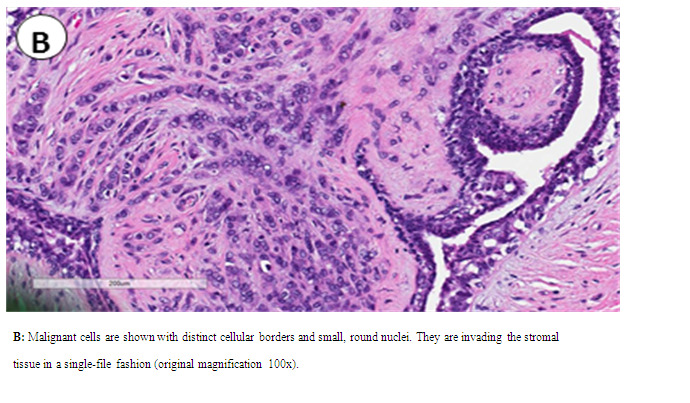 Ductal carcinoma in-situ was identified in approximately 10% of the tumor and was located mainly in the FA (Figure. 2C). Two more FA's were identified at the sub areolar and 5:00 measuring 1.3cm and .5cm in largest dimension, respectively. Metastatic carcinoma was identified in 6/6 lymph nodes sampled. The largest metastatic deposit in the lymph nodes was 0.6 cm, with extra nodal extension identified. She recovered from surgery and was counseled to undergo completion axillary dissection, adjuvant chemotherapy and radiation, but she refused further treatment. Figure 2: Patient 2, Invasive Ductal Carcinoma arising within a Fibroadenoma. A: Fibroadenoma is demonstrated by well-circumscribed fibrous overgrowth of stroma on the left, which is compressing the glandular elements; the invasive ductal carcinoma is shown to the right of the fibroadenoma (original magnification 200X). B: Focus of invasive ductal carcinoma is seen in the center of fibroadenoma (hematoxylin-eosin, original magnification 40X). C: Ductal Carcinoma in Situ (DCIS) arising within fibroadenoma. Expanded ductal lumen due to proliferation of neoplastic cells in the background of intracanalicular fibroadenoma (compressed ductal lumens due to stromal proliferation) (hematoxylin-eosin, original magnification 100X). Although FA can occur at any age, the peak age of women at diagnosis is in their second decade [6,7]. Since breast cancer is rare at this age, it has been thought that the two are unrelated. However, a study by Dupont et al found that the risk of breast cancer was 2.17 times higher among patients with FA, and that risk increased to 3.10 if the FA was classified as complex. The average age for carcinoma arising from FA has been reported to be 42.4-44 years old[9,10]. The most common histologic type of carcinoma within a FA is lobular carcinoma-in-situ (44.7%), followed by ductal carcinoma-in-situ (40%), invasive ductal carcinoma (6.7%), both ductal and lobular carcinoma-in-situ (5.7%) and invasive lobular carcinoma (2.9%). The treatment of these tumors depends on the histopathologic staging, as well as the molecular profile of the tumor (ER, PR, HER2 status). While many cases of invasive lobular and ductal carcinoma have been reported as arising from a FA, there have been very few reported cases of metastatic disease. A comprehensive review of the literature using Ovid search terms "fibroadenoma", "carcinoma", "breast neoplasms", "secondary, primary neoplasms", "multiple primary neoplasms", "recurrence local neoplasm", and "metastasis" revealed three reports of metastatic ductal adenocarcinoma arising from a fibroadenoma[12-14]. However, to our knowledge, we are the first to report extensive nodal N2 metastatic disease (>3 lymph nodes), and also metastasis from lobular carcinoma. Although rare, we recommend sentinel lymph node biopsy for breast carcinomas arising from a fibroadenoma, with standard treatment of the axilla based on the sentinel lymph node biopsy results. Prior to their diagnosis of breast cancer, both patients presented here were followed conservatively, according to the guidelines for FA. When invasive cancer was first diagnosed, both patients had N2 metastatic lymph node disease. The incidence of invasive cancer arising in a fibroadenoma is rare, and although the risk of metastatic lymph node involvement is very infrequent, axillary lymph node staging is important for clinical decision-making. We thank Eileen Figueroa and Steve Schuenke for their assistance with this manuscript. 1. Schuerch, C.3rd, Rosen, P.P., Hirota, T., et al. A pathologic study of benign breast diseases in Tokyo and New York. (1982) Cancer 50(9): 1899-1903. 2. Limite, G., Esposito, E., Sollazzo, V., et al. Lobular intraepithelial neoplasia arising within breast fibroadenoma. (2013) BMC Res Notes 6: 267. 3. Hughes, L., Mansel, R., Webster, D. Benign disorders an diseases of the breast concepts and clinical management. Second edition; London, UK: Harcourt Publishers Limited, 2000. 4. Cerrato, F., Labow B.I. Diagnosis and management of fibroadenomas in the adolescent breast. (2013) Semin Plast Surg 27(1): 23-25. 5. Yang, X., Kandil, D., Cosar, E.F., et al. Fibroepithelial tumors of the breast: pathologic and immunohistochemical features and molecular mechanisms. (2014) Arch Pathol Lab Med 138(1): 25-36. 6. Gashi-Luci, L.H., Limani, R.A., Kurshumliu, F.I. 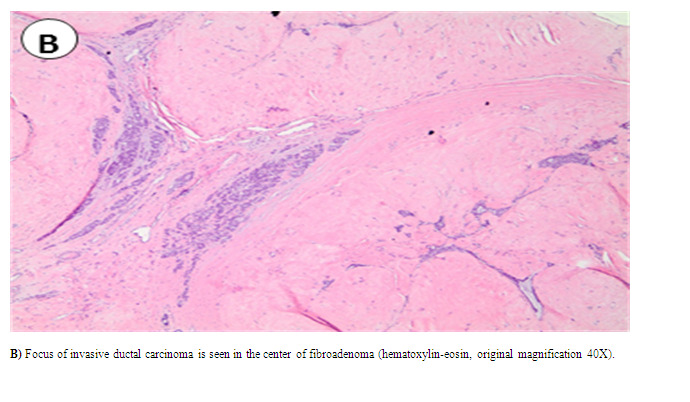 Invasive ductal carcinoma within fibroadenoma: a case report. (2009) Cases J 2: 174. 7. Deschenes, L., Jacob, S., Fabia, J., et al. Beware of breast fibroadenomas in middle- aged women. (1985) Can J Surg 28(4): 372-374. 8. Dupont, W.D., Page, D.L., Parl, F.F., et al. Long-term risk of breast cancer in women with fibroadenoma. (1994) N Engl J Med 331(1): 10-15. 9. Goldman, R.L., Friedman, N.B. Carcioma of the breast arising in fibroadenomas, with emphasis on lobular carcinoma. A clinicopathologic study. (1969) Cancer 23(3): 544-550. 10. Pick, P.W., Iossifides, I.A. 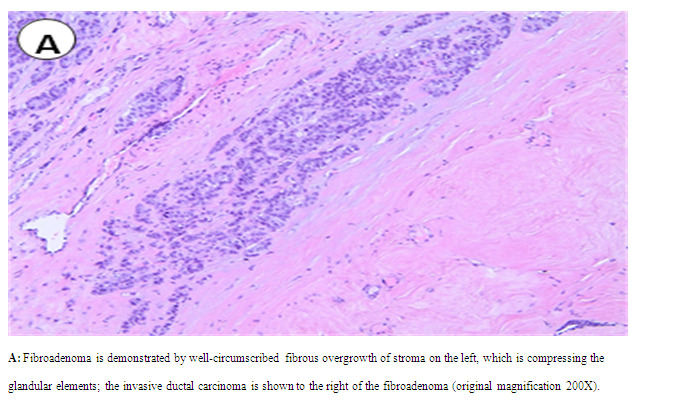 Occurrence of breast carcinoma within a fibroadenoma. A review. (1984) Arch Pathol Lab Med 108(7): 590-594. 11. Diaz, N.M., Palmer, J.O., McDivitt, R.W. Carcinoma arising within fibroadenomas of the breast. A clinicopathologic study of 105 patients. (1991) Am J Clin Pathol 95(5): 614-622. 12. Abe, H., Hanasawa, K., Naitoh, H., et al. Invasive ductal carcinoma within a fibroadenoma of the breast. (2004) Int J Clin Oncol 9(4): 334-338. 13. Abu-Rahmeh, Z., Nseir, W., Naroditzky, I. Invasive ductal carcinoma within fibroadenoma and lung metastases. (2012) Int J Gen Med 5: 19-21. 14. Rao, S., Latha, P.S., Ravi, A., et al. 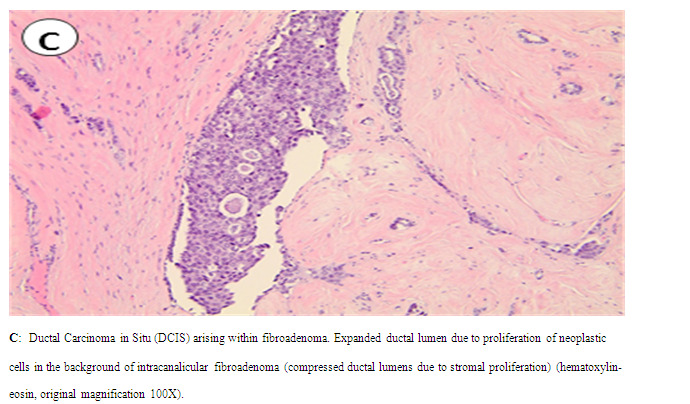 Ductal carcinoma in a multiple fibroadenoma: diagnostic inaccuracies. (2010) J Cancer Res Ther 6(3): 385-387.